The word resonance comes from music. Think of a tuning fork resonating at a certain frequency. If you play the guitar, think of how you tune it by playing the same note on two different strings.In the context of an investment pitch, resonance happens when the investors get excited about something in the pitch and start to push it forward in their imaginations. The last time I saw it happen in a real presentation was about a year ago when a startup called kalood.com told how its social media retail application solved a real problem for a local pizza chain. The story showed how the pizza people, their customers, and Kalood all solved each other’s problem in one simple example. After that, the investor group liked the idea, liked the company, and wanted more detail. (disclosure: I haven’t followed up; I don’t know what’s happened to that company since). 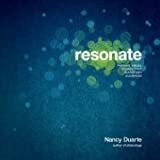 For a great explanation of how to achieve resonance in a pitch, read Nancy Duarte’s book Resonate. It’s worth way more than what the book costs, and your time reading will be well spent. Thank you for the recommendation, Tim!